Managers at Edinburgh airport cut Alex Salmond’s access to VIP areas after he was accused of sexually harassing female staff, it has been reported. 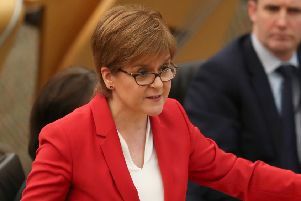 Last week, it was revealed police investigating sexual misconduct claims against the former First Minister are looking into alleged incidents at Edinburgh Airport in 2008. There was no formal complaint or investigation - and no evidence of wrongdoing by Mr Salmond, The Sunday Times reported. But the newspaper said it was agreed that the former first minister would no longer be escorted along a private corridor and stairwell that is used by staff and high-profile passengers but closed to the public. It is understood Mr Salmond was not directly informed of the decision although it remained in force throughout his time as first minister. Airport officials instead related their concerns to the former SNP Deputy leader Angus Robertson, who was also leader of the party’s Westminster group at the time. However, it has since emerged Alex Salmond’s former bodyguard gave a statement last year denying the former MP had behaved inappropriately towards female staff at Edinburgh Airport when he was First Minister. The Sunday Herald said Roger Cherry, who also served as a Government driver for Mr Salmond, claimed that he accompanied him almost everywhere and would have seen anything inappropriate at the airport. Mr Cherry, 51, worked as a police officer for the Met before becoming a driver and was allocated to Mr Salmond in 2007, working in his private office until 2008. Mr Salmond has launched a legal challenge over the process used by the Scottish Government to investigate the claims against him.